Key Source International announced GSA approval for it’s biometric keyboard and stand-alone biometric pod. KSI products are approved under FIPS 201 for Federal Employees and civilian contractors. 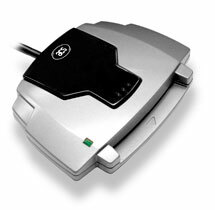 The KSI-1700/GFFB biometric keyboard and the KSI-1008F biometric pod meet these requirements for FIPS 201. Marktron of Frederick, Md., whose primary focus is on OEM’s, systems integrators and military/government agencies, represents KSI in the federal market.